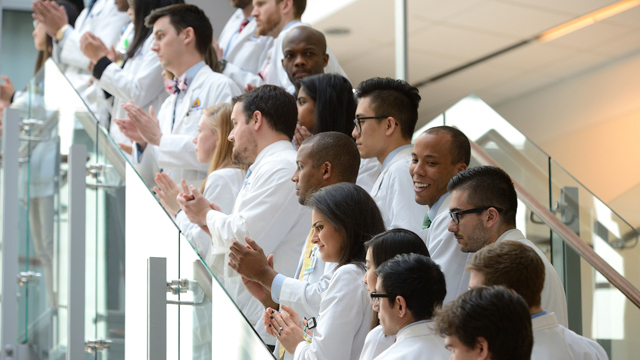 Thank you for your support of the School of Medicine! Click here to see a complete list of Funding Opportunities. If you are interested in learning more, please contact Chad Newill, Senior Director of Development at the School of Medicine. Payments in the amount specified above will be automatically charged to your account as scheduled until you notify The School of Medicine by phone at 888-546-1336 or email somgiving@jhmi.edu. JHU will use your e-mail address to send a transaction confirmation and for other university communication. Your information is private and is not shared with outside entities. Are you a School of Medicine alumnus/a? Questions? Call us at 410-361-6561 or 888-546-1336, or e-mail us at SOMgiving@jhmi.edu. Phones and email are monitored between the hours of 8:30 a.m. and 5:00 p.m., Monday through Friday. Any questions or comments sent before or after that time will be answered on the next business day.